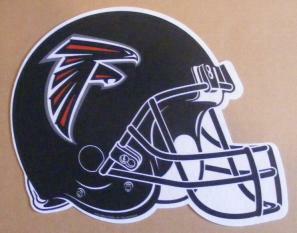 Full color logo on a helmet shaped pennant. Size is about 15" wide. Made by Rico Industries. Price shown is for a minimum order of 12 die-cut pennants. Less than a total of 12 pennants will cost $3.00 each. You may mix or match between all team die-cut pennants to receive the 12 price.